Earlier, I had received a PM from a cotter to help try out the Maybelline Pure Mineral products (it pays to be noisy on a forum :P )but I had declined because I'm allergic to Maybelline Angelfit (it makes me itch :( ). But, later chiaberry passed me a sample of hers to try. :D So I managed to test it without having to let it go to waste. So here's my review. I got to test out shade Light Ochre OC1 and blusher was Rose. So here's my thoughts. (I'm judging it with some knowledge in mineral makeup). It goes on pretty well, very light just like any mineral makeup will do. The foundation shade was a little off for (too beige and maybe a little dark) but it doesn't seem to be very "off" compared to real mineral makeup (which can be pretty obvious when you get the wrong undertones on). Also it gives a glow on your face, but it turns out to be over-glowy for me after a while. I suppose it's due to the bismuth oxychloride which is added in most non-mineral makeup to give a glowy look. The blusher was very natural, not so glowy as the foundation. There are 3 shades to play with and I liked how they labelled it. If you are warm-toned, you can buy Peach. If you are neutral, you can get Rose. If you are cool-toned, you can buy Cool pink (honestly I forgot what's the third blusher called). Please bear in mind Pure Minerals is not true mineral makeup. Like L'oreal/Revlon/Red Earth mineral makeup, it still contains ingredients that are comedogenic. Bismuth oxychloride is one example that irritates the skin and it can lead to breakouts in some girls. If you are already a user of real mineral makeup, I would suggest you to forget about this product. It is very likely you'll get a breakout from it when you switch from your powder to this due to the bismuth oxychloride. I did get a bump after using it. If you are a user of commericial non-mineral makeup, and you wish to try this product, go ahead. I think it's still a little better than commercial makeup out there. There are currently 4 shades available. From what I remembered, it's OC1, W02, B01 and maybe R01. 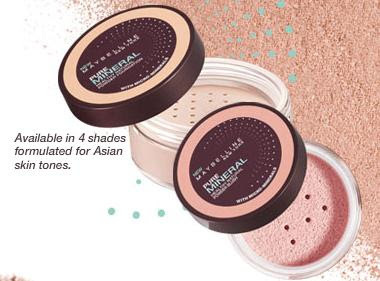 It's very limited shades and like one shade for each undertone family. If you can't find a match, don't buy it. Just wait for new shades to come. Foundation costs $25.90 and blusher costs $19.90. Dah, guess I really bought the wrong shade of colour, light 01 ochre. Looks yellow on my skin and my dad complained about it. Boo.. Not so healthy natural makeup foundation after all. Oh, and I didn't know Kabuki brush is not supposed to be that scratchy, gonna throw that brush away I guess. Or maybe good for some skin masaaging. Hehe.